Let me first say that I am not a gaming for gaming’s sake kind of player. I am a fairly busy person and therefore have to pick and choose what I play carefully in order to maximize the enjoyment while engaging in my chosen hobby. I don’t really play iPhone games (even though I have one and love it unconditionally), I am hard-pressed to find a game on the Wii that I am just dying to try and I absolutely prefer to interact with my Xbox far and above any other console. So, while collecting the data necessary for writing a summary of 2010, I can see clearly all of the games that, if I were a real game journalist or reviewer, I would regret not trying out strictly for evaluation. But I am neither of those things; I am merely a player who happens to enjoy writing about my experiences, and I don’t quite have the largest pool to choose from in regards to cross-platform familiarity. This doesn’t mean anything, really, other than when I write about 2010 I am coming from a very specific place-a place that doesn’t include some of the games you or your friend or that guy at Kotaku would consider highlights, such as Call of Duty, Fallout New Vegas, Gran Turismo 5 and/or anything having to do with Microsoft’s newest peripheral, Kinect. I never tried Sony’s Move and I don’t have an account on Steam. I am what I am, and since you are reading this, you must think that what I have to say is meaningful enough. This week I am going to summarize my first year as a video game blogger in three separate posts: one about the games that I started but didn’t finish, one devoted to my favorite player experiences this year and one about what I am looking forward to in 2011. Splinter Cell: Conviction – I rented this game last spring and intended it to be my first full Tom Clancy experience. After playing so much Assassin’s Creed, I assumed that another Ubisoft stealth game would be easy peasy. I was wrong. I made it about an hour in before it became obvious that my hanging-out-the window/shooting skills were rudimentary at best, and that I wasn’t having any fun. I am not the biggest fan of the big crime/vengeance environment unless it’s set in the Renaissance or has dragons in it. Approximately 1.5 hours were spent with Sam before I gave up the ghost. Final Fantasy XIII – I tried so hard to love this game. I played the linear story until I reached the Steppe, forcing myself to adore the paradigm system and trying to piece together the narrative by listening carefully and re-reading the explanations in the menu, but in truth my motivations for playing were less for the actual events in FFXIII but for the feeling of nostalgia I hoped would swirl around me, reminding me of the countless hours I spent playing FFVI & FFVII while I was a teenager. I failed. I got to a pipeline just off the Steppe, was properly defeated by a monster several levels ahead of me and gave up. The idea of grinding held no appeal. My Xbox was dying at the time and would freeze during graphically noisy fight sequences. My teenage love affair with JRPGs is over. Approximately 25-30 hours were spent with Snow & the gang before I threw in the towel. Red Dead Redemption – Okay, so let me first talk about my relationship with Rock Star sandbox games in general. I like them fine, but only if the environment is appealing. Bully remains one of my favorite gaming experiences of all time, and I enjoyed cruising around GTA: Vice City because it was so deliciously 80s and had a killer soundtrack. I would never play GTA IV because the world doesn’t appeal to me in the slightest. I didn’t feel this way about RDR, necessarily, because I am mildly interested in the Wild Wild West, but after about 5-6 hours riding my horse, chatting with people, riding my horse, chasing bandits, picking flowers, riding my horse & finally, riding my horse, I failed to engage. And I know this is my own and not the game’s fault, because it truly is a beautiful rendition of the Old West. If I could name any reason for my disinterest in continuing not long after starting it would be the g-d wolves. I got mauled by at least a dozen wild packs of them. Approximately 5-6 hours were spent riding alongside John before I wandered off into the sunset without him. 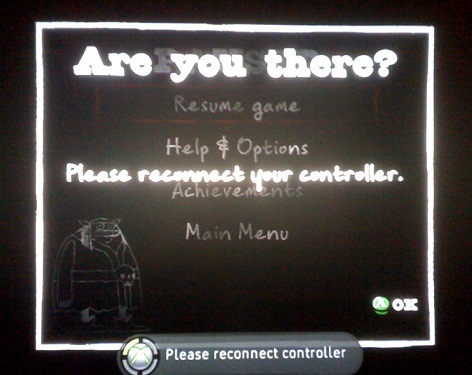 Left 4 Dead – One word: anxiety. I get enough of that in real life, thanks. Castlevania: Lords of Shadow – This was another one I desperately wanted to like and complete, but unfortunately, it got too difficult for me to continue. I made it through the first of the Titan battles after a LOT of swearing and couch beating, but the second one did me in. And although the overall narrative and setting were okay, I also failed to fully invest enough to want to keep going. Sadly, my Castlevania count remains at zero, but I understand that the franchise is amazing and hope one day to find one that hooks me. Rock of the Dead – This game was bad. Really bad. Matt and I tried to find the fun in its zombie killing musicstravaganza, but it was so bad. Nier – Nier was a quiet little RPG slash Action Adventure game that had some serious potential. The narrative was interesting in the big picture sense, and the spell casting was imaginative. But sadly, it was also really, really boring. The RPG elements involved a lot of running back and forth between two areas or two buildings and the load times were fairly epic-even when merely entering and leaving the town library. I liked the collecting/gathering/errand running aspects combined with the real time fighting, but overall it was just too understated and monotonous to keep my attention. I got the feeling that a playthrough in Nier would take up a huge chunk of time and I wasn’t interested enough to make that kind of commitment. I imagine if I would have had lots of idle time it would have been easier to continue playing, but after approximately 6-7 hours I left Nier and his sick daughter behind to battle the shadows without me. The Sims 3 – I tried really hard to like being back in the nonsensical life simulator that is The Sims, acquiring the console version from Gamefly sometime before Thanksgiving and giving up right before Christmas, but ultimately let it go for the same reason I have abandoned Sims games in the past-they are so ridiculously uninteresting. I began the game as a single lady, hell bent on writing a novel and succeeding in her journalism career, and left as an old lady saddled with three children and no money to pay for their care. I know I could’ve taken a different route, but ultimately it was the silly challenge list and sense of urgency the game employs to keep you going that frustrated me to the point of forsaking it completely. I mean, how the heck am I supposed to write a novel, throw a party, buy books on sale, paint a masterpiece, raise a child, earn skills points and maintain a career in the time allotted me before I am considered ‘elderly’ and sent out to pasture? I am letting this one go for good this time. Approximately 15-20 compulsive, unhappy hours were spent trying to seduce a guy name Louis before a fire broke out in my house and I stopped caring forever. 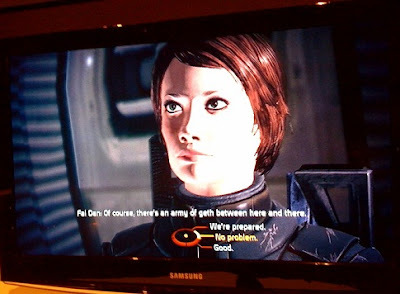 Mass Effect – Despite the dozen or so hours I have spent playing Mass Effect, the story has yet to grab me. I loved Dragon Age a lot, so I know that investing in a Bioware environment has it’s payoffs, but I am starting to understand myself a little more here: I love Tolkien fantasy more than space fantasy. Nevertheless, I hope that after spending just a litte more time with Commander Shepard that I will find the love that everyone else professes to feel. Brutal Legend – This one became a victim of neglect when I put it down to play something else and never picked it up again. In other words, it’s not you, Brutal Legend, it’s me. Singularity – I got caught in my own little lock up in this one. I really liked it, despite the obvious similarities to Bioshock, and intended to keep going until I ran into a room without enough bullets to take out everyone inside. Once again, the game was forsaken in order to play something else, but I would really love to dive back in at some point and try again. A toast to all those that went unplayed, and to those I left behind. I will definitely be playing some of the 2010 releases in 2011, but I will write more as I play them.